R. G. Kirk, E. J. Gunter & W. J. Chen, 2005. A major limitation of AMB supported machinery is their dependence on auxiliary or backup bearings in the event that the magnetic bearings lose power due to control system failure. These backup bearings should be designed to withstand the severe loads encountered after the AMB failure when the rotor drops onto them. This has prompted the development of general purpose finite element based, non-linear transient analysis programs capable of evaluating shock loading, blade loss and rotor drop phenomena experienced in rotors supported by AMBs. Previous testing and results have been made for a single AMB drop or both AMBs of a two bearing rotor. The current interest also includes the multiple AMB supported machinery systems, i.e., systems with more than two AMB or auxiliary bearings. 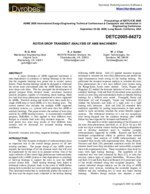 This paper reviews the method of rotor drop analysis for AMB bearing systems. A commercially available program, DyRoBeS, is then applied to four different rotor designs to evaluate their rotor drop transient response. The total power loss rotor drop results of four different rotor systems will be discussed for assumed backup bearing conditions.